Humphrey Arundell (c. 1513 – 27 January 1550) of Helland in Cornwall, was the leader of Cornish forces in the Prayer Book Rebellion early in the reign of King Edward VI. He was executed at Tyburn, London after the rebellion had been defeated. Sir James Dyer (1510 – 24 March 1582) was a judge and Speaker of the House of Commons during the reign of Edward VI of England. Joan Bocher (died 2 May 1550 in Smithfield, London) was an English Anabaptist burned at the stake for heresy during the English Reformation in the reign of Edward VI. She has also been known as Joan Boucher or Butcher, or as Joan Knell or Joan of Kent. Kett's Rebellion was a revolt in Norfolk, England during the reign of Edward VI, largely in response to the enclosure of land. It began at Wymondham on 8 July 1549 with a group of rebels destroying fences that had been put up by wealthy landowners. One of their targets was yeoman farmer Robert Kett who, instead of resisting the rebels, agreed to their demands and offered to lead them. Kett and his forces, joined by recruits from Norwich and the surrounding countryside and numbering some 16,000, set up camp on Mousehold Heath to the north-east of the city on 12 July. The rebels stormed Norwich on 29 July and took the city. On the 1st of August the rebels defeated a Royal Army led by the Marquess of Northampton who had been sent by the government to suppress the uprising. Kett's rebellion ended on 27 August when the rebels were defeated by an army under the leadership of the Earl of Warwick at the Battle of Dussindale. Kett was captured, held in the Tower of London, tried for treason, and hanged from the walls of Norwich Castle on 7 December 1549. The Prayer Book Rebellion, Prayer Book Revolt, Prayer Book Rising, Western Rising or Western Rebellion (Cornish: Rebellyans an Lyver Pejadow Kebmyn) was a popular revolt in Devon and Cornwall in 1549. 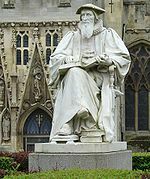 In that year, the Book of Common Prayer, presenting the theology of the English Reformation, was introduced. The change was widely unpopular – particularly in areas of still firmly Catholic religious loyalty (even after the Act of Supremacy in 1534) such as Lancashire. Along with poor economic conditions, the enforcement of the English language liturgy led to an explosion of anger in Devon and Cornwall, initiating an uprising. In response, Edward Seymour, 1st Duke of Somerset sent Lord John Russell to suppress the revolt. Sir Ralph Vane, also known as Ralph Fane (died 26 February 1552) was a supporter of Edward Seymour, 1st Duke of Somerset,and hanged on Tower Hill as a result of factional strife. St John's Wood is a district in the City of Westminster, London, lying about 2.5 miles (4 km) northwest of Charing Cross. Much of the neighbourhood is covered by a Conservation Area, a small part of which extends into neighbouring Camden.Traditionally the northern part of the Ancient Parish and Metropolitan Borough of Marylebone, it extends east to west from Regent’s Park to the Edgeware Road, with the Swiss Cottage area of Hampstead lying to the north.Once part of the Great Middlesex Forest, it was from 1238 a wooded farm of St John's Priory, Clerkenwell (the Knights of St John of Jerusalem) before Protestant Edward VI of England sold the farm to noblemen. It is an affluent neighbourhood, with the area postcode (NW8) ranked by Forbes magazine as the fifth most expensive in London based on average home prices in 2007. According to a 2014 survey, St John's Wood tenants pay the highest average rent in London, with rents averaging £1,889 per week. The Prince and the Pauper is a novel by American author Mark Twain. It was first published in 1881 in Canada, before its 1882 publication in the United States. The novel represents Twain's first attempt at historical fiction. Set in 1537, it tells the story of two young boys who are identical in appearance: Tom Canty, a pauper who lives with his abusive father in Offal Court off Pudding Lane in London, and Prince Edward, son of King Henry VIII. The Prince and the Pauper (German: Prinz und Bettelknabe) is a 1920 Austrian silent adventure film directed by Alexander Korda and starring Tibor Lubinszky, Albert Schreiber, and Adolf Weisse. It is based on Mark Twain's 1881 novel The Prince and the Pauper about a poor boy who switches places with Edward, Prince of Wales in Tudor England. For the first time in this Austrian film, a child actor, the Hungarian Tibor Lubinszky, who at eleven years old could already boast a respectable career in cinema, was called to play the double role of protagonist. Young Bess is a 1953 Technicolor biographical film made by Metro-Goldwyn-Mayer about the early life of Elizabeth I, from her turbulent childhood to the eve of her accession to the throne of England. It stars Jean Simmons and Stewart Granger as Thomas Seymour, with Charles Laughton as Elizabeth's father, Henry VIII, a part he had played twenty years before in The Private Life of Henry VIII. The film was directed by George Sidney and produced by Sidney Franklin, from a screenplay by Jan Lustig and Arthur Wimperis based on the novel by Margaret Irwin (1944).